Mama Mzungu: Why should I lie to my kid about Mickey Mouse? "Will we really, for real, meet Mickey Mouse in Disney World?" Caleb asks me incredulously, but also hopefully, between bites at the dinner table. "WHAT THE HELL KIM!??!" Colin screams at me with his eyebrows from across the table. Later I get the lecture: Can't we just allow him this little mystery? This magic. It's part of the fun. Let's keep alive some of the wonderment of childhood while we can. To which I say: What? Create magic? Isn't the whole world magic to a 4 year old? In the last week he's asked me: "Who makes the rain?" "How does milk make bones stronger?" and "Can we fly to January?" And, we already ask him to believe in things he can't see, like God and germs. The whole world is shrouded in mystery, so I don't really see the point in weaving some fantastical tale about talking mice. take great pains to make my answers plain, clear and truthful. It's a big charge - being the ambassador of another person's reality. So, why would I knowingly, and with no real practical pay-off, lie to him? Anyway, I don't know what "real Mickey Mouse" he's picturing, but I can confidently predict that when he's face-to-face with this monstrous mute mouse who is exaggeratedly trying to hug him, Caleb will run terrified behind my back. Like all 4 year olds who have gone before him. I can see that this is Scrooge-y and unfun of me, but I really don't get it. Maybe my cynicism derives from the fact that I never celebrated Christmas, so never believed in Santa, as a child. I have no fond memories of believing in something wondrous and fantastical (but also no memories of that belief being crushed when I discovered the truth). My parents did attempt the illusion of a tooth fairy, but I don't recall being convinced. I do remember being amazed at my mother's stealth-like ability to take a tooth from my under my pillow and replace it with a dollar without waking me. And I did feel special and loved to be the object of such effort. Maybe I just find it strange that adults have collectively agreed that it's perfectly acceptable create an elaborate lie just "for fun" while the rest of the time we are admonishing our children in all seriousness to tell us the truth. If this whole ritual is confusing for me - a thinking adult - it's gotta be confusing for them. I promise you I'm not normally this sick-in-the-muddy. I freely dispense tickles and rides and goof around with my kids probably more than is advisable if I'm to retain any authority. But I'm honestly baffled by this. Is it just me, people? Is there something I'm missing? I'm with you, Kim. There are enough things that are worth lying to your kids about ("what are they talking about on the news? ", "what do mommy and daddy do after I go to bed?") that I don't see the point in lying about corporation-sponsored fantasy creatures. Maybe I'm a Scrooge too. Thank you! And great points. I totally forgot to mention all the lies that DO have a practical purpose which we are forced to tell them. It's enough, right? 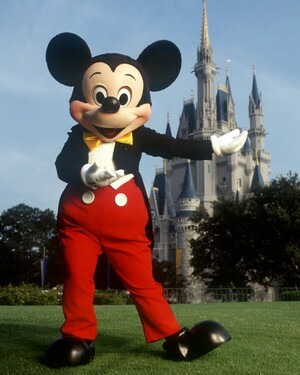 If you tell Caleb that this isn't the real Mickey Mouse but just an imposter in a costume, doesn't that imply that there is a REAL giant black mouse who walks upright and wears red pants and a bow tie? I actually think that the Mickey Mouse at Disney World is as REAL as this mouse gets! Have a great time! ha!!! That's funny. I don't think that Sam ever thought there was a real mickey mouse. He thinks everything on TV is pretend. we were watching a football game several months ago, and there was a very hard hit and i said "Ow." "Mommy, why did you say 'Ow'"? "Because I thought that might have hurt the football player." "don't worry mommy, its TV, its just pretend." But, he still can't sit through "Finding Nemo" b/c its "too scary." As for Santa, even though we are jewish i feel like i can't tell him santa is fake, b/c then he'd ruin it for his friends. I have to wait until I'm sure he can reliably keep a secret. And then there is the whole God thing. I know there is no such thing as God, but I think my kids should be able to decide for themselves what they believe. But, it feels dishonest for me to try to tell them there is such a thing as God when i know that's not true. So, i just don't talk about God at all. I know one day he'll come home from hebrew school with a surprising question for me. That football example is so sweet. Caleb says thing like "don't worry mommy it's just pretend" when he's getting too into the good guy/bad fighting play. And .... oh about god - that's a whole other ball of wax we are struggling with. I wrote that line in the post, but the truth is we haven't told him much on that end because I can't seem to get the words out of my mouth given how ambivalent I am myself. It's not easy! The question is: what do you tell him about Santa? If you tell him the truth, odds are he goes to school and tells his friends. If you continue the lie, how do you explain why Santa doesn't come to his house? A child's mind is filled with the wonderment and adoration of all the things around them. We have filled it with stories of good and evil, true love, and people coming together to triumph over adversity. A world that has unlimited possibilities before the cynicism of the world embeds itself. If used properly these stories teach lessons that give a sense of righteousness or in some cases what not to do. The story of the tortoise and the hare tries to convey that complacency can lead to failure. At the end of the story do you say "By the way a tortoise and hare wouldn't never really race?" Children are a lot more resilient than we give them credit for. And as children become disillusioned, I don't think they will hold it against us the years of joy and fantasy portrayed in the way only fantasy can. I think it a far bigger injustice to tell stories of a omnipotent person in the sky that watches your every move who is judging you... but that's for another conversation. My logical mind agrees with you but in my heart I'm all for the magic. I did believe in Santa Claus and while I was disappointed when I found out he wasn't real I'm so glad I have those magical memories and I never held a grudge about being lied to - in fact I really appreciated that my parents went to all that effort to make my childhood so magical and I shamelessly lie to my girls about these types of things.